Now that most of us are in that cold and rainy/snowy season, keeping a car clean becomes nigh impossible for those unwilling to host the flu, pneumonia or frostbite. If you’re fortunate to have a garage or an area shielded sufficiently from the elements Griot’s rinseless wash and wax is a game changer. My car was moderately soiled from a long rain period and I was struggling to find both time I had available from real life duties and when mother nature granted me a window to wash my cars. 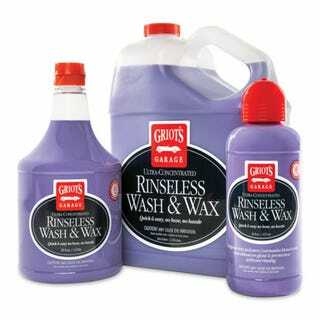 Enter Griot’s garage rinseless wash and wax. I had the garage door closed, two five gallon buckets of water filled and their 15:1 dilution spray bottle ready. I was worried about scratches and swirls apart from improper lubrication before I started, but like any good relationship you have to jump in at some point. Presoaking below the beltline with the concentrated spray bottle as recommended in the video helped me relax a bit about potentially destroying the perfect finish I currently have on my car. I started above the belt line with a fresh microfiber cloth folded so I have eight sides per cloth, four per side. I used the concentrated spray bottle for areas that I feared had too much dirt and after a single small pass with a microfiber cloth, I would use a new side. I never reused the cloth nor did I rinse it out in a solution bucket. Only after the top was cleaned did I go below the belt. Light passes with plenty of concentrated spray, using many microfiber cloths removed the dirt. I feel this way help keep me from introducing small scratches which require a bit of polishing to get out. Since there was no rinsing, the entire process, including the wheels took about 30-45 minutes. The car was spotless, shiny, and no scratch marks. I did this in the comfort of my garage, stayed warm, didn’t get wet. This is definitely a winner. I kept the solution in one of the buckets with a cover on it and when I was ready to wash the car a two weeks later I noticed that the wax had come out of suspension. Keep only enough solution to thoroughly wash your car or it seems like it will be thrown away.